Look away now if you're squeamish about insects, spiders and creepy crawlies! Today was our annual pest and termite inspection. One of the joys of living in Australia is that you get to share this wonderful country with many a creepy crawly! As our house is predominantly timber we have decided on 'better safe than sorry' and fork out the necessary $$$ to be checked yearly for the dreaded termite. We also get a spray of something magical that keeps the spiders and cockroaches where they should be - out of my house! 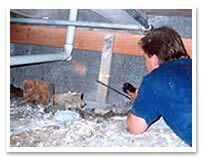 When we purchased our house, part of the contract included a pest inspection and report, and when I read what could be found I was horrified. If left to their own devices, these little horrors can literally eat away the timber of your home and turn it to dust! 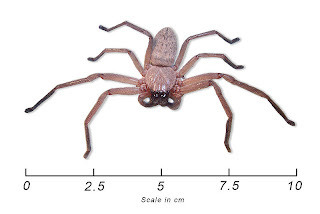 So pest man came, tapped around, peeked in every nook and cranny and gave the good news - "nothing to report" (phew)....well nothing expect the biggest huntsman spider that I have EVER seen. Even pest man was impressed. I got the camera out to take a photo, but it was just too big to get close. Pest man tried the flip flop (thongs if you're Australian) method, but the darn thing was too quick and hid behind the glass cabinet. In the end we vacuumed him up (spider, not pest man!!). 'Papa' was then tasked with taking the vacuum cleaner apart to check and get rid of the spider. Half an hour and half a can of insect spray later we think it's gone...but I'll be checking under the bed tonight! Yes the vacuum is the best method I agree! I have a problem with flies at the moment that is making me crazy. Always seems to be one hovering about!! Shoo fly!!! Oh, Bethan! You poor darling. I absolutely loathe huntsmen (my parents used to call them tarantulas when we were growing up - quite different beasts!). The annual inspection by the Rentokil (what a name!) man was also an essential for us. One house we had was plagued with silverfish. They're so disgusting - I hope you never meet one.